dbForge Schema Compare for MySQL is a tool that allows users to compare the structure of two MySQL databases. dbForge Schema Compare for MySQL supports MariaDB database servers as well as Percona servers, and you can easily manage MariaDB users and their privileges. The tool gives a comprehensive view of all differences between MySQL database schemas, generates clear and accurate SQL synchronization script that can be used to update database schema. Compare tasks for MySQL schemas can be scheduled using command line interface. 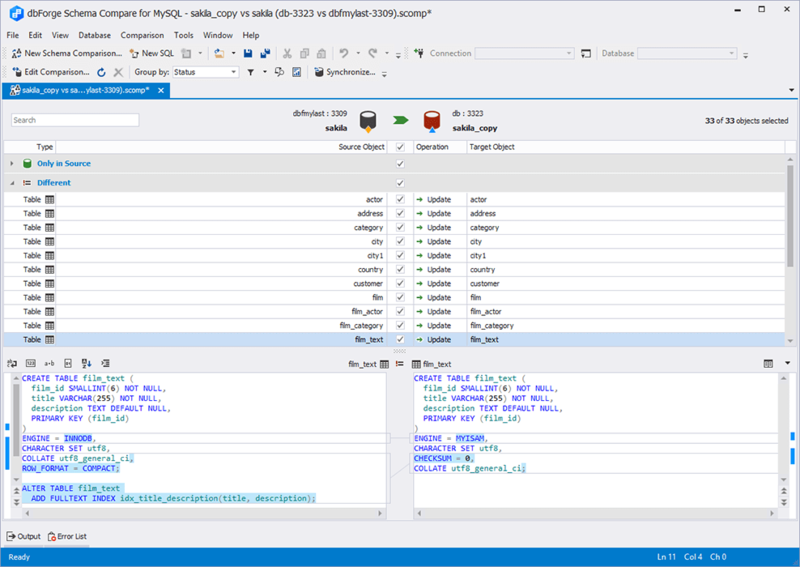 How dbForge Schema Compare for MySQL can help DBAs and developers? Devart offers Schema Compare for MySQL and Data Compare for MySQL in one package dbForge Compare Bundle for MySQL. Save hours of work comparing and deploying MySQL databases – buy dbForge Compare Bundle for MySQL now and double your success!